It seems that everyone is featuring earrings like this these days, but since my last name is Pearl, I think the timing couldn’t be better. Love & Pieces is an online boutique which carries one stunning version of the new classic by Meridian Avenue Jewelry. In 5 different colored pearl finishes, to boot. Complete with sterling silver hardware and backings, you can be confident they won’t irritate sensitive ears. This style has been seen on the likes of J Law, Rihanna, and Emma Watson, so Hollywood starlets have been spotted wearing these bad boys everywhere. They couldn’t be more on-trend! For all of your statement necklaces and scarves this fall and winter, you can’t go with a better stud earring. Not your favorite? Shop around a selection of 17 different designers for something that’s totally you! Disclosure: This is a sponsored post brought to you by Love & Pieces. While I was compensated for this post, all opinions expressed are my own. This post comes to you from sunny Ixtapa, Mexico, where I have some brief downtime and wifi access now that the sun has gone down. Interestingly enough, it’s the perfect opportunity to talk spring and summer accessories since I’m in quite the mood with my base tan over here. The combination of gold and coral is a hard one to top and that’s why I was drawn to this bracelet from indie brand Urbitious. The lovely texture and jingle to this layered piece will look great with any beach frock or flowy top you choose. Perk up your neutrals, or give some contrast against turquoise, royal blue, or vibrant mandarin. The choice is yours with this super cute and affordable piece! p.s. 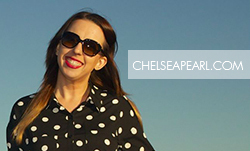 be sure to follow me on Instagram for some vacation snaps & style inspo! For someone with the last name Pearl, I actually don’t own that much pearl jewelry. Sure, I have a few earrings and necklaces here and there, but not much besides the true classics. I think my next addition to the pearl jewelry collection will be something fun with a twist, and I think this piece by Saint Christine would be a great fit! Mixed in with this layered freshwater pearl necklace is a chain of crystal beads, coming together in a nice tangled texture in the middle. Great as a focal statement piece, I think this would be beautiful paired with a dress or even a classic chambray top. Saint Christine gives wholesale volume discounts, so if you’re ordering multiples (say for you and mom!) you can get a nice discount. Also, they ship worldwide! FTC Disclosure: This is a sponsored post on handmade jewelry brought to you by Saint Christine. While I was compensated for this post, all opinions expressed are my own. Maybe it’s gossip girl, maybe it’s my grandmother… but something has inspired me to become in desperate need of pearls! 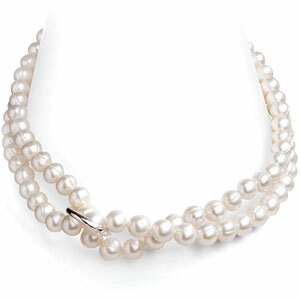 A good pearl necklace is a staple for any wardrobe and should be used as the cherry on top to that perfect outfit. Whether you are headed for the ballet or a night out on the town, throw on your pearls and you’ll be the bell of the ball.